The Lumu Power 2 Power is a light meter for your iPhone. It connects using the lightning port and is made of stainless steel, which helps it withstand demanding uses. It uses two sensors, one of which is based on the CIE 1931/DIN 5033 color standard, while the second is a silicon photodiode that captures light at 750000 measurements per second. Each Lumu unit is calibrate before shipping and comes in a leather bag. Other technical features include the ability to measure color temperatures from 1600 to 18000K and an exposure range of -4 to 20 EV at 100 ISO with an accuracy of ±0.1 EV. It also syncs with flash units anywhere from 1/40000 to 1/250 sec in duration and can measure illuminance ranging from -0.15 to 250000 lux with an accuracy of ±3%. While this is the Power model of the Power 2, users can upgrade to the Pro model from within Lumu's app for an additional fee. Made of durable stainless steel housing and polycarbonate lexan diffusers, the Lumu Light Meter can withstand demanding use. 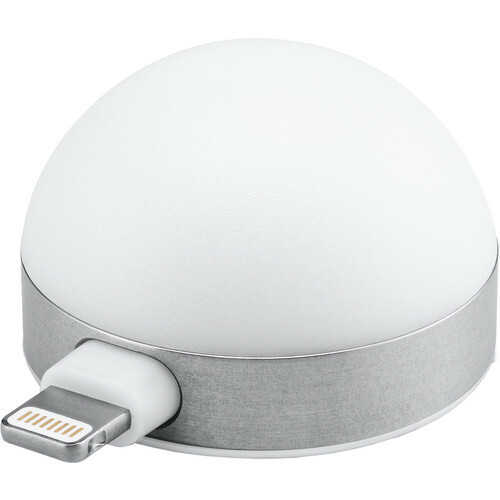 Lumu Power incorporate two sensors. A True Color sensor, based on the CIE 1931/DIN 5033 color standard, and a fast silicon photodiode both capture light at 750000 measurements per second. Each Lumu is calibrated before leaving the manufacturing line and comes with a calibration certificate. Box Dimensions (LxWxH) 7.05 x 3.6 x 1.6"